Known for their signature three falling petals, irises (Iris spp.) grow between 4 and 36 inches tall, depending on the variety. These perennials commonly blossom in the spring and summer with colors ranging from orange to purple. Once the flowers fade, you may be tempted to remove the foliage, but it is critical to leave the greenery intact for several weeks. Irises thrive in U.S. Department of Agriculture plant hardiness zones 4 through 9. In general, cut the greenery back six to eight weeks after your blossoms die back. Although the foliage appears unsightly, it is slowly gathering energy to be stored for next season's flowering. Rhizomes, or underground stems, store photosynthesized energy from the dying foliage. If the rhizomes do not store enough energy, your irises bloom with less vigor or fail to flower altogether next season. The only foliage alteration you can make is simply folding the leaves downward if they are waving wildly in all directions; do not tie them into a bundle, because this process hinders photosynthesis. Your greenery is ready to be cut back when it appears yellow and has a papery texture. However, each leaf does not yellow at the same rate as others -- only cut portions that are obviously depleted of green pigment, called chlorophyll. Your irises can be slowly pruned of their yellowed foliage to create a neater garden appearance. In the meantime, plant distracting ground cover or other blossoming flowers around your irises to disguise the location. Creeping foliage and spectacular flowers make it easier to ignore the dying iris leaves until you can completely trim the greenery back. Most iris varieties enter dormancy in July through the warm, early fall. Autumn is a practical time to cut your greenery back, especially if you want to dig your rhizomes. After two to three years, iris rhizomes clump into a mass that impedes vigorous flowering. Dig your rhizomes in the fall, and divide them. Each rhizome piece needs to have some roots and a bud-growing point. Plant these pieces in your garden for widespread blossoming come spring and summer. Unlike the foliage, flower stalks need immediate removal after they start fading. Because you need the leaves to remain healthy until they yellow, your decaying flowers become a liability: They hold molds that easily infiltrate the leaves if left to rot in place. You also want to direct energy into foliage energy production, not seed production. Fading flowers are usually creating seed pods; removing the flowers directs energy into the leaves and rhizomes for storage and vigorous blossoming potential next season. 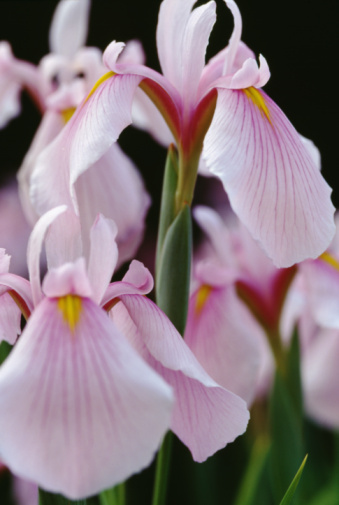 Do Irises Need to Be Protected From Frost?